Discussion in 'Moopy Moop' started by dUb, Dec 6, 2018. My top artist was Sheryl Crow. A usual mix of Eurovision, European pop and old stuff. 46 of the 100 songs are not in English. I never realised that I listened to THAT much foreign music. Italian, French, Spanish, German, Greek, Russian, and Korean are all featured. No Swedish though, but then there’s not much schlager released these days. I never had Lolly down as a Nicki Minaj- Pound The Alarm fan. Full of surprises that one. SDF and Pipo like this. I know right. I'm such a hepcat. No duets, that’s the name of the remixer. Oh and RuPaul is in there but that’s it! I'm such a dummy, what option do I choose in order to share? COPY LINK? Where do you see the top artists? Oh Kala <3 I still have this on heavy rotation, I thought I was the only one (we probably are). Where are those stats hiding? 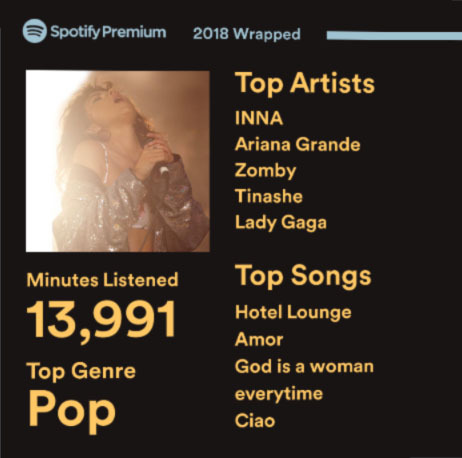 Interestingly the top 5 songs are different than the ones in the 2018 playlist above. The fact I still buy cds or pay for downloads and thus play cds or from music apps on phone has caused this to be slightly askew for me. Otherwise how can I explain that my most played Spotify artist of 2018 was Samantha Fox. I’m astonished. Otherwise how can I explain that my most played Spotify artist of 2018 was Samantha Fox. Because she has one of the best songs of the year. That’s true actually, it must’ve been playing all the Hot Boy mixes. I spent four hours listening to The Chainsmokers this year. I wonder what experiences and memories I missed out on. What i've discovered is that often my pocket picks stuff for me and my #1 song is something i've never heard of. Oh come on, we're not swallowing that - what is Indie's secret shame song? It's called "Soul of my girl" by Oskish Kera. How doth one emb the playlist here? See my post above. Someone/thing else was definitely playing this Oskish Kera on my account. I changed my (admittedly very basic) password and it seemed to stop. What a year! What a list!